Sites of Saytagrah, India's non-violent freedom movement is part of the Tentative list of India in order to qualify for inclusion in the World Heritage List. 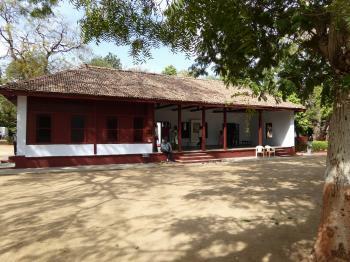 I only visited the Sabarmati Ashram in Ahmadabad, which is a well-developed tourist site with a nice ghandi museum and the barracks of the ashram itself. The site seems to be one of the more prominent ones in the proposal, there are a lot of minor sites whose relevance is a bit dubious. The Ahmadabad ashram is certainly an interesting and moving visit - but strictly because of the political and historical background. The buildings itself are quite sober - plain barracks without decorations, fitting Ghandis austere lifestyle. While I have the highest respect for India's non-violent movement, I don't think that a WHS is a good way to honor it. It's all about the ideas and the philosophy - not about sites and buildings.